I was born in the Year of the Dragon and have been looking for something special like this. Great work. I had this as my lock screen on my iPhone4 for a long time. I got several comments on it, lots of people really liked it. It was perfectly cropped for that resolution. I agree with the others about requesting a variant without the dragon. I'm not really into dragons, but the overall scene is really nice here, and I would love it without the dragon. Still a quality piece though, Ryan. This has really grown on me since using it as a wallpaper on my phone. I love dragons anyway, and the way the clouds are illuminated from behind gives a feeling of brightness but still allows good contrast with icons. A lovely piece of artwork that is also practical to use. Amazing! It reminds of the times, when I traveled in an airplane, far above the clouds, watching the dragons from afar. I live in Muskegon, Mi. which is right on the eastern shore of Lake Michigan. We have Pere Marquette Park, only one of dozens of beaches where residents can swim in gorgeously clean water. It would be so cool to see that dragon in the night sky over our lighthouse on the breakwater. Wow! Beautiful work as always, Ryan! Another 10! I don't understand why so many people are saying, "You need the dragon." By producing a pickle jar version without the dragon, for the people that want a shot of just the clouds, planets, etc. isn't ruining any of the with-dragon photos, of which there are now three. Why is it so bad that a few of us want a shot without a dragon stealing the focus? It's just for the pickle jar. "In the year of the dragon..."
lots of men dissapear. I have to say I really love this new render of yours. I do like both the beach and sky scene, but I prefer the latter. I like the yellow/orange color in the beach one but I think the sky scene feels more natural. I really like the clouds in the sky version but you really need to get those sun shafts in there like how the beach scene is, then it would be perfect! As a side note, I'm not really sure why there is even a discussion about the dragon being in the image. That is the focal point of this piece, and the artist named it based on this fact. Why people think not having the dragon is even an option is beyond me...Take the dragon out and there is not much to look at (no offense to the artist, it would still look good, just not nearly as interesting). I agree with Chris B. You need the Dragon. It makes the whole picture. Without it there would be no interest,just another cloud or beach picture. The dragon sparks our imagination. I read some of the comments. If you do a dragon-free version, I'm putting in my vote for the beach version to be dragon-free. It is such a gorgeous scenery! However, I do feel that it would lack something without the dragon because then would lose a focal point for the scenery so then you'd almost have to add something else. Maybe a sailboat or some seagulls or something?? "Year of the Dragon (2012)"
I recommend you setup a remote access application (most support tablets & smart phones) on your render systems so you can check in while you're away. Could save days/weeks if you are able to restart the render right away instead of waiting until you return home. Will there be a dual screen w/ full clouds at some point after it finishes rendering? Both are great and will go on my desktop rotation. If I could have my own way however, I would love a to have the beach scene without the dragon. I lose myself in these pictures (some people meditate, I look at DB images) and find any sentient being a little too distracting! This one is really nice. A night time version would be awesome as well, maybe with the dragon breathing fire, lighting up part of the night sky. My other complaint to make you better then the rest is that there has never ever been a triple in the pickle jar. I cant believe how terrible the triple monitor versions come out. You need to get three monitors to test these. The 5760x1080 looks like a dragon and a sun. The ghosting of the clouds was my favorite part of the entire image. The 5760 users got screwed out of looking at them. I loved the 1920x1080. For how long it takes to turn these into triple monitor renders, i've been a very disappointed lifetime member. First of all, thank you for reading the FAQ. It is skipped all too often. I still turn down 99.9% of all commission work. This is the only one I have attempted since the 90's. This piece was for someone that I genuinely respect (Elon Musk) and I wanted to do it. In the end, however, the commission fell through and I was able to share it with the folks who have kept me working these past 14 years. "Do you do commission work? No, the members gallery keeps me too busy to accept any outside projects. I set up the members gallery so I could work for the public. Since they pay my salary, I would be cheating them if I took time away from the members gallery to work on outside projects." Just find it strange that this contradicts the FAQ, either way - love the piece, and really like the dragon! "Gallery Version is still the winner"
I personally don't think it would look right w/out the dragon, but that's just me. When the people are added, 75% of the time I think it looks just as good with or without them, but this one needs it I think. The lack of clouds takes away from the mysterious magical nature of the piece and having the beach that close makes it look like it is happening a couple hundred feet off of the ground, rather than a few thousand feet up close to the stars and the edge of our planet. 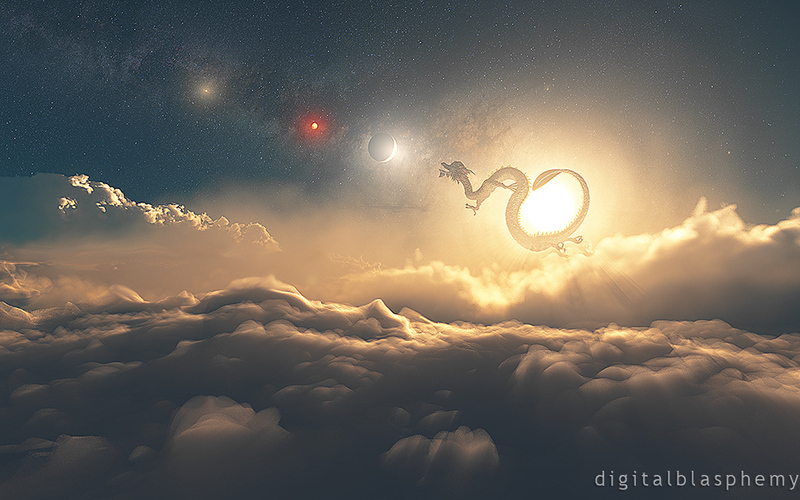 The one with more clouds looks alright, but I prefer the muted softer clouds in this piece that focus the attention on the dragon, sun, & planets. I agree that this image would be kinda plain without the dragon. I don't really get why people want it removed, especially when it's the centerpiece of the image. I think I like the firstclouds pickle jar version better than the gallery version. I don't like the beach in the beach version. I like how the sun looks yellower in the beach image... maybe I'd like the beach image as a whole if the beach was better looking. I love the beach version just as much as the other two. It reminds me of the cover to the 1st album of super group Asia. I like the clouds. Bring the dragon out a little from the light, and make it a triple-head, and it'd be perfect for me. Helps frame the picture and provides a reference point. Also like the orangish color. The picture would be much too plain without it. I feel the dragon makes the picture good. Without it, it would just be sun and clouds. Kinda pretty, but nothing exciting. Or perhaps some people have different taste? It's not that difficult to understand why some of us would like to see an image without a dragon -- especially such a beautiful image. Bright, cloudy, deep scenes such as these are kind of rare on DigitalBlasphemy, and this is one of them. Why lose the dragon in a piece called Year of the Dragon? I like the Dragon. It belongs. I am done. I simply like the view of nature itself, or space, or planetscapes, etc. I'm not a fan of seeing, say, space stations, roads, dragons, people, and so on. Normally, I totally don't mind in a lot of pictures -- however, this one, the scenery just looks gorgeous and it feels like the dragon steals the attention. I know adding people and the like can add a sense of scale, but... why? Sometimes, I love just how captivating the image is as a whole, without a central focus. I'm running on a duel monitor, and taking the 2560x1600 res, cropping it down to 1024 height, I have a perfect alignment of planets on the left, and a superb dragon on the right. This is preposterous! How can you have a "Year of the Dragon" without a dragon? Personally, I don't think the great artists of the past ever asked the viewing public how they felt about their works of art. Just imagine how Vincent van Gogh would've felt if his fans told him that they liked the background, but the "Irises" or the "Sunflowers" had to go. I like the dragon myself, but I can definitely see the desire some have for one without. Basically, it kind of comes down to the space vs. planet scape debate you've mentioned having with some images. I think some prefer just the amazing background, in which case something else in the foreground just "gets in the way." This would be particularly true in this case if they aren't attached to the theme. The dragon would detract from the image for those who want to imagine a 1st person perspective rather than 3rd. I would be happy to render a version without the dragon, but I am curious as to what people have against it. Ryan, you have already stated that the theme is space exploration, and Mars is featured prominently here with the other aligned planets. I must admit that I've been distracted by the landing of MSL Curiosity lately, and by the neck-and-neck Olympic race between China and the US. I see the three aligned planets as Gold, Silver, and Bronze with the Chinese dragon in pursuit. Intentional or coincidental? We can never tell what is going on inside your head. "Impressive, but loose the Dragon ;)"
It is really cool how everything is lined up and the milky-way is expanding out like the dragon's breath. I am partial to European/American dragons, but the Chinese ones are more wise/wisdom/magic related than the general death & destruction we are used to so thumbs up! If you are really interested in doing pickle jars for this one you could always swap the dragon for the golden one, maybe with a little dragonling flying next to him. or if you're sticking to sets of three, you could add the mother too. No real need to do it of course, but it would be cool. So, perhaps this was for someone at SpaceX (for the SpaceX Dragon reusable spacecraft)? I agree. Can we get one without the dragon. Since this was a commissioned piece I included a few things for a specific reason. 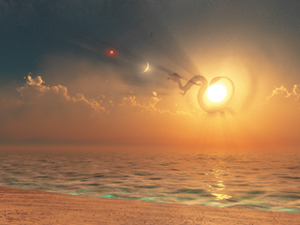 The sun is seen through the dragon itself, the "red sun" is actually Mars (not to scale), with Jupiter beyond. The theme of the piece is space exploration. The traditional Chinese dragon does not have wings. Its powers are mystical and thus a dragon does not need wings to fly or to control the water. Wings here would be inappropriate. I really like the upper half of the picture, but the lower clouds seem VERY strange to me: too much grain and too few structures. The dragon is in the original style of a chinese dragon. It is not an american "dungeon & dragon's" type dragon with wings that may be more familiar. It is so awesome, true to form! You wouldn't happen to be willing to produce a pickle jar version that doesn't have the dragon? I love the scene so much!!!! Any way we can get a pickle jar version with the dragon removed? Just not feeling it. So cool man, my son was born this year.. means alot to me. 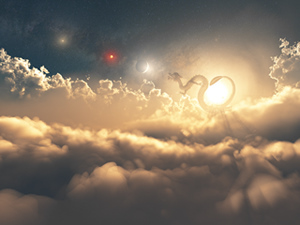 Will stay on my desktop for awhile.. LOVE the clouds..
"Year of the Dragon 2012"
Multi Screen of this would be stellar. I like how the milkyway is lined up as the dragon's breath going over the lined up planets (thus bringing life). Outstanding work. "I seem to be with the few..."
I have to admit that I really don't like this one at all. It's the dragon. It looks, well, fake. I also find the three planets distracting. (Are the other two stars? I don't know...) Your other dragon piece was far superior. I look forward to whatever you have next. I really liked how the planets and the sun align and lead the eye. Agree that it needs wings. Looking good. Can't wait for the dual display. Excuse me, but not much imagination and originality here compared to other "out of this world" landscapes and scenes. ""Year of the Dragon (2012)""
Epic! This is the kind of stuff I'd like to see more often! I really, really like this piece. It reminds me of book cover illustrations and seems like it should be the cover of some fantasy novel. If the dragon was a little less dragon-y and a little more dog-y it would totally remind me of a scene from "The Neverending Story" where Falcor the luck dragon is flying across Fantasia. I thought it was inspired by Dragon Ball! That would have been awesome! My guess would be Christopher Paolini.. authour of The Inheritance Series.... great books!! ... that it was originally intended for Robert Jordan? I saw it and thought Wheel of Time. This just seems too bright, which makes it look 'hazy'. I love the concept... I was born in the 'Year of the Dragon'. ChrisSpera, ... but Anne McCaffrey passed away in November. Still a super image! Another awesome work! Thank you! "Bit too bright for me"
I'd like to be able to see more definition on the dragon, either by reducing the sunlight glare or perhaps move the dragon out of the suns direct light. How does it fly without wings? Hi! Any widescreen versions of this. Instead of the spherical effect if you render it as one picture can you render the side screens individually so they match up with the cloud line? Such a great piece. Love the colors and the way you have the Dragon seem to blend into the sun, can we encourage you to make a version with a larger Dragon. As always, YOU ROCK Ryan!!!! "Love it, can we have a night version, pleeease!" Love it, can we have a night version, pleeease! One of my all time favorites. Superb. looks absolutely awesome on a 27" iMac. Well done, sir!! I don't always post a comment, but this piece is really great, so it warrants it. Kind of reminds me of Dragonball. Love this wallpaper! On it's own it's a great piece. It shares though, a trait with Subartic. Where you could have three definite different pieces. One without the dragon, one with the dragon, and one with a different creature or modified dragon (with wings). Will be wondering if you will have this sit as is or will see what else can be created with it. I love dragons too, but they have wings??? I understand that they are magical so anything is possible but I love flying dragons with wings soaring or diving or something? He looks like he just popped up out of nowhere ;-)! Of course it still is my new backround ;-)! varun guessed it first. Someone close to Mr. Musk commissioned a private piece for his birthday. Unfortunately (but fortunate for my Members) the private commission fell through. I thought the idea I had come up with was worth pursuing however and I'm glad you guys like it! My first impression, like ChrisSpera's was of the Red Star of Pern. Of course the general shape of the dragon and the fact that he is riderless pretty much puts that theory to rest. But still, I do envision that as a dragon about to jump to the red star. Is there a year of the Tiger somewhere? This is great only thing is maybe dim down the star? Dragons and Stars are my faves u make ! Thanks! Gonna Guess Anne McCaffery on this one. Flying dragons...Red Star... clearly its a Pern thing. Dragon capsule in the sky? I agree that a little tweaking would make the dragon stand out a little more. But either way, it's really cool. Hoping for a triple display version. First off, awesome render! Has an amazing feeling of depth. You can also never go wrong with dragons. As for a guess I'll stab and say Richard Branson for a few reasons. It involves space which we all know he's obsessed with. The dragon thing is also big for him. On a side note am I the only person that at one point heard the theme for the Neverending Story in their head? Cool But Funny Becuase I Was Born On Year Of The Dragon Nice!